renovations My store is closing for a week, and with the scheduling they have done I have a 10-day week off work. I hope it's really improved there. You see, our store is mostly good enough. The floor tiles clean well, and yet don't show a lot of grime when they're bad. They are really nonslip, so when mopping or when people make them wet (say with melted snow) it is business as usual. They're just great and I hope they either leave the tiles alone or replace them with something just as durable. I am not privy to the work being done, but heard my share of rumours. A new fridge in front (showcase), possibly not as tall. A new freezer too, with room for our ice cream offerings. New cupboards in front for holding the syrup and coffee we use, possibly at shoulder height where the wall is now. We are supposed to get space to have our breaks in the back room without impacting on the office desk and computer area. lunch 11am Nothing fancy, but still prepared with love. Pork cooked in white sauce with frozen vegetables and black pepper (yes, the normal black pepper). And Chinese dumplings (pork and vegetable flavour). Afterwards we just decided it might make sense to have a nap and get up later, to start again. So we did. 2 pm I really wanted to go out of town. Normally I don't have a Saturday to myself, so wasting it seemed so wrong. Going shopping again is probably just a mistake, as I could probably be a survivor in a Zombie or Apocalypse movie with the stores of food I maintain. We used to live so close to the Finch Regional Terminal, but now it requires a subway trip to get there. It is oddly the same as before and different. They have redesigned a lot of the exterior, but the place is still just a waiting room, a snack bar which sells tickets and provides reluctant travel information, and public bathrooms. There are automated Viva terminals, where you buy a ticket you probably won't show to anyone. 4 pm We didn't spend much time in the terminal because a Viva Blue was loading, and it just didn't make sense to wait for the next one. It could be half an hour! So I used a machine next to the bus stop as quickly as I could. Originally I was giving it all of my twonies, but realized that I might need actual coins for my return trip. the ride The ride itself was smooth. We got lovely seats in the back of the articulated bus. It turns out they have tables there, and people bring their pizza or whatever. It was nice to see forward, left and right with clarity. It's too bad they have added a handle which is permanently affixed to the side of each seat. This poked into the side of my leg for the entire trip, and caused undue pressure on us during the ride. all built up I wanted to see how the plazas and stores along the way have progressed. It is all built up since my last ride out this way. Thornhill There are so many new condos and stores in Thornhill. They have completely torn down the old G-E-M store and plaza. The last user of the space was Galleria, a Korean 24-hour supermarket. They have moved to Yonge and Steeles into the old Chapters property. The Wendy's there has been gone a year I suppose, but it was missed by us because it had convenient parking and was along Yonge Street. It was a place I would often go with my parents. There is a foot bridge which is closed to the public due to its rusty condition. It goes to the next plaza which is still vibrant. It has a few Asian restaurants, a P-A-T supermarket (also Korean, but not 24h), an Italian bakery restaurant (Nino D'aversa) and much more. We might have gotten off, but for today, I wanted to see as much as possible, rather than get involved in eating. Richmond Hill Richmond Hill seems so big now! Was it always so spacious? I guess it has to be but I just remember it as a smaller place with more vacant treed lots. When I thought up this trip, it was main street Richmond Hill I wanted to walk around and see. But we noticed that there are no pedestrians on the main part of Main Street (Yonge). Sad. We remained on the bus too. Here is a comfort: I didn't see very many vacant stores. I've always thought it silly for landlords to continue to raise their rents so that only GAP Cartier and other big name players can afford to play. Hillcrest and South Hill I guess people who shop prefer places with lots of parking and the big names they know and love. Hillcrest Mall is not new. It was around 30+ years ago. It is shaped like so many other big name malls: it has big stores like Sears and Zellers on the edges and smaller stores in between the bigger ones. If you go inside, there will be signs directing pedestrians to the big stores, as landmarks or as freeway destinations. Across the street is South Hill in another familiar design. A big supermarket (No Frills) dominates the smaller collections of food players (Subway, Lone Star). It is nice to see that restaurants that make Japanese food don't have to be big franchise names to succeed. This plaza, and every other one along the way, had some kind of sushi house which looked open and had customer's cars parked in front. Richmond Heights I am getting old. I remember the old 59 North Yonge bus to Richmond Heights plaza. WWW historians don't seem to recall it, as I'm not finding enough articles about that bus, or its replacement, the GO Transit "C" service. I have found some things about the Toronto and York Radial Railway. It didn't make enough money, so they shut it down. The places outside of Toronto weren't as populated as they are now, and commuting wasn't as popular. I've read that the railway was a necessity because the roads were so bad, rail technology was needed. And it was a radial service so they didn't have to create a northbound and a southbound track. Instead they used a single track, but doubled it up at towns where they expected to meet the streetcar going the other way. 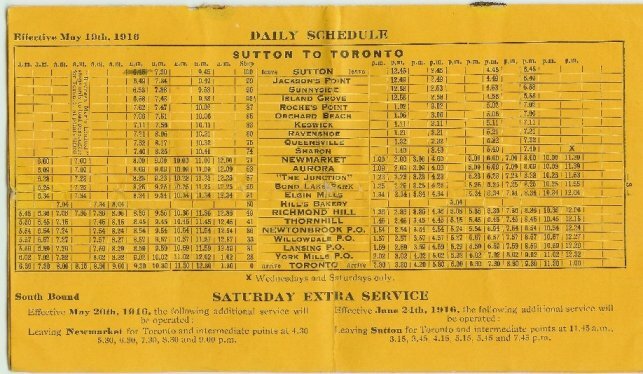 TYRR ran from Toronto to Sutton. Newmarket I didn't see an "old Newmarket", just a new one. I wanted to plot out where I could wander around. What I did see was two massive plazas on the Northwest corner of Hwy 11 and Hwy 9. So sprawled out I was thinking I wouldn't want to visit them without the use of a vehicle. There is a more traditional plaza on the Southeast corner. I should have probably taken pictures, but I have a wonderful camera that really wants to only take pictures of faces. Oh, it has a Landscape Scene mode, but all of the other settings are optimized for getting someone's face and smile right. I digress. It looks like modern Newmarket is about owning a car to get around. I can't imagine that the kids are all chauffered by their folks. There must be a town centre somewhere there. A place where delinquent students smoke with friends instead of attending school. the trip back I really like wandering around different stores, but in Truth, I don't need anything at home, and felt cheap about spending another $8 just to get off the bus for a little while. We stayed on the bus (but changed seats so we had room to spread out instead of being jammed into each other because of the seat hardware). KFC Taco Bell We ended our trip by eating at the KFC at Steeles and Yonge. I was in the mood for other things, such as sashimi, but this was available instantly, and for $4.19 we could each be satisfied. Is it possible to discover something new at Taco Bell? Yes: the Beef Burrito has the creamy nacho sauce instead of the grated process cheese. I find it rough to admit that a simple change like that would improve the product so much. Oh yes, a side of sour cream seems to also help.